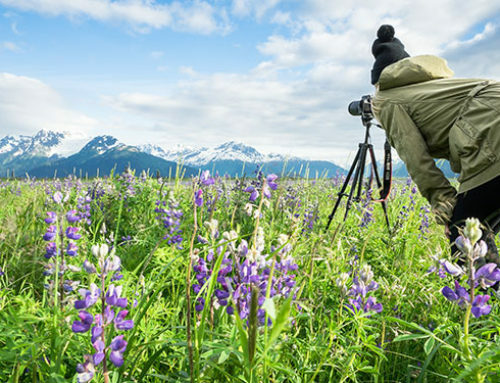 Alaska Photo Treks can design your photo experience in any time of year, but read below if you want some great ideas for an Alaskan winter adventure! 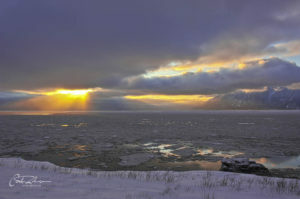 The morning sun bursts through the clouds over the Turnagain Arm south of Anchorage – at high noon. 1. Golden light all day long. Most landscape photographers will prefer to photograph early in the morning and late in the evening in order to photograph in the warm, golden light that peaks during those times. The warm light brings out colors and textures, but normally lasts only for a short time, giving way to harsh, “cool” light. But with Alaska’s winters, the sun stays low on the horizon all day long, giving us warm, golden light from sunrise to sunset. 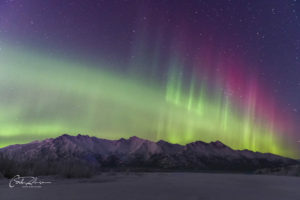 Aurora borealis over Chugach Mountains. 2. The aurora borealis, or northern lights. 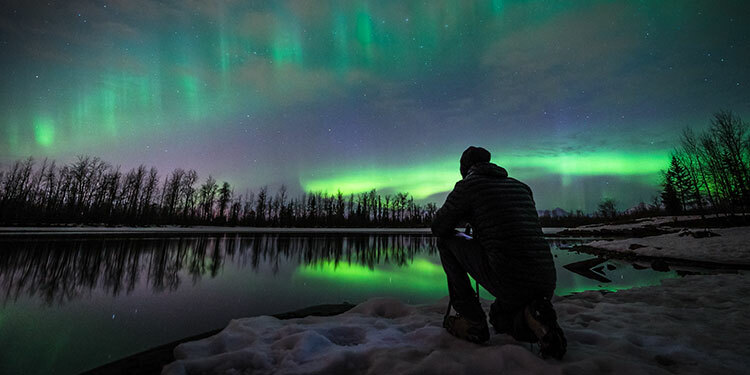 Some people think that the aurora comes out only in the cold, but the key factor is darkness. And in Alaska, the darker the days, the lower the temperatures. 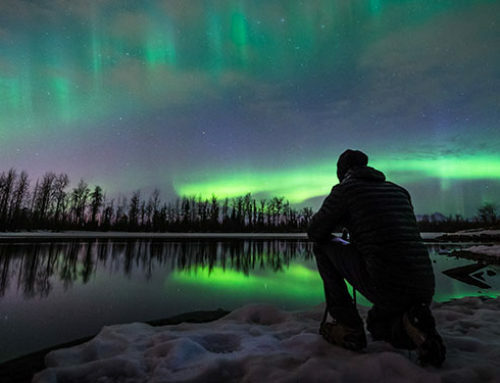 The farther north you go, the more darkness in the winter, and the more aurora viewing opportunities. 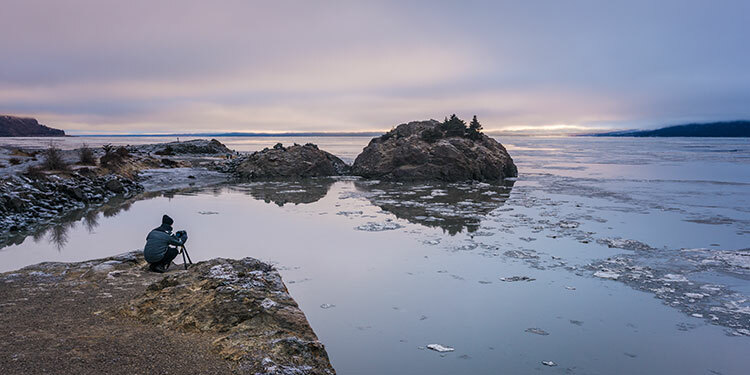 Winter pastels of blue and pink – Cook Inlet and Mt. Susitna. 3. A pastel color palate. With snow on the landscape, and the low light in winter, magical things happen with light at the beginning and end of the day. 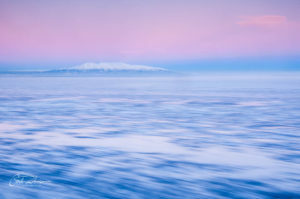 The blue shadow of the Earth on the horizon coupled with the warm pink of alpenglow create a landscape bathed in beautiful pastels. Add the blue hues of ice and you have a luscious combination of color! Morning sun shines through a hoar frost-covered cluster of willows near Naknek. 4. Winter’s crystals – hoar frost. Whether in a coastal zone or the deep heart of the interior, moisture can sometimes find its way into the air. When that happens, either from ice fog or open water, the moisture finds structures to build its wintery art of the ice crystal structures called hoar frost. 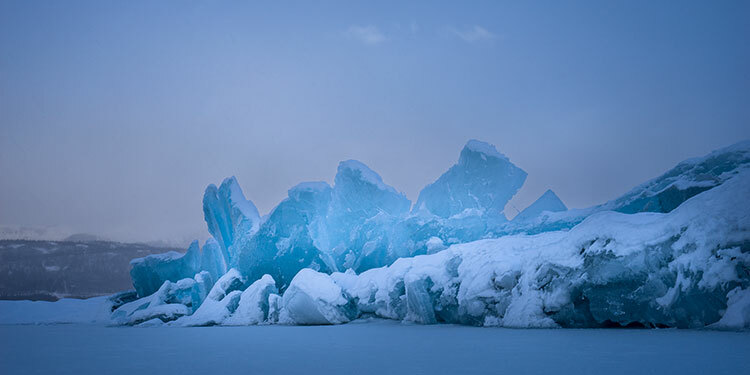 It adds a sense of wonder and beauty to any winter landscape, and can be found throughout the Alaskan winter. 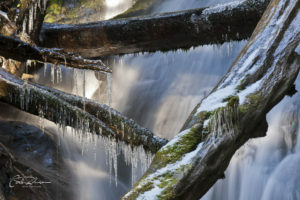 Icicles and moving water near Sitka. 5. The joys of ice and moving water. Elements of contrast are often part of designing a photographic composition. Whether color or tonal contrasts, or contrasts of texture. 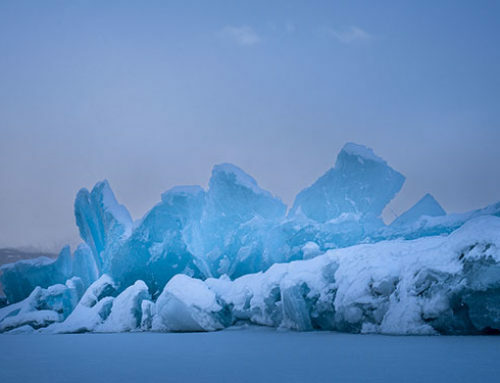 In the winter, you can explore the contrasts of moving and frozen water. 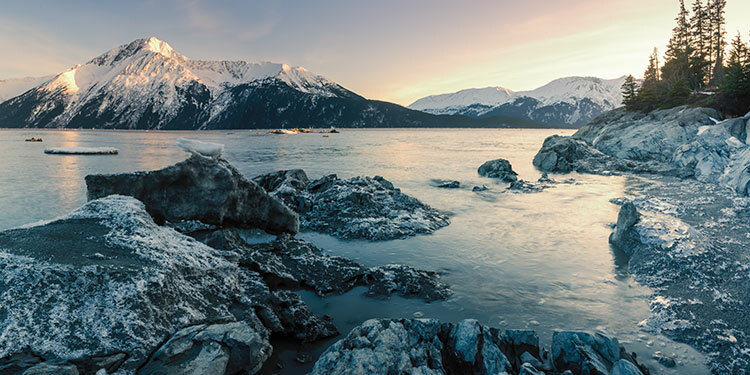 In order to explore this, you need to travel to coastal areas such as the Southcentral area near Anchorage, or to the Southeast in places like Juneau and Sitka. 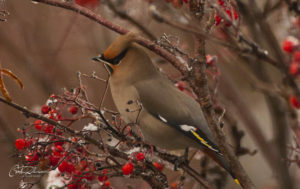 Bohemian waxwings can often be found feeding on red mountain ash berries. 6. Flocking hordes of Bohemian waxwings. The spectacle of migrating wildlife can often be a photographic draw. In Anchorage, one of our winter visitors is the Bohemian Waxwing. They show up in December, swarming around town in flocks of hundreds, hammering the mountain ash trees for their fermented red berries. They move constantly and can be fleeting at certain locations, but when you find them, they are a photographic delight. Rich colors over the Anchorage Coastal Wildlife Refuge. 7. Those long, colorful coastal sunsets. People who come to Alaska from more southern locations are often amazed at how long our sunsets last. This lengthy dance of light is magnified in the winter, with rich colors that start well before sunrise or long after sunset. The rich colors cannot be found at any other time of year, and you don’t have to get up too early or stay op too late. View from inside the sled while mushing on a frozen river. 8. The action and adventure of dog mushing. 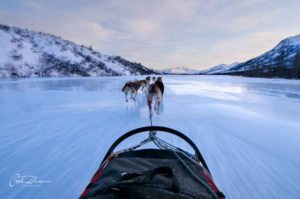 Dog mushing is the official Alaska state sport and deeply connected to Alaskan culture. But it is also a lot of fun to photograph – allowing you to test several techniques of capturing movement. You can photograph several regional or long-distance races, or try it out with a variety of dog mushing tour operators. 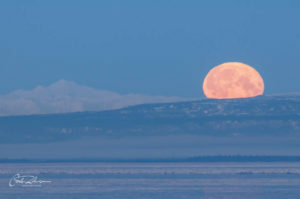 A distorted full moon drops behind the Alaska Range. Because of the challenges in balancing exposure, the best time to photograph the moon is when a moonrise or moonset coincides with sunrise or sunset. And, as it turns out, the timing for that is in the winter, with January being one of the best months. 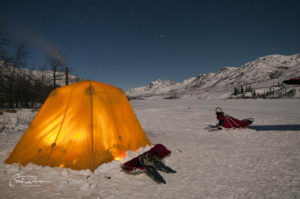 Winter camping brings access and solitude. 10. Only the truly dedicated are out there! 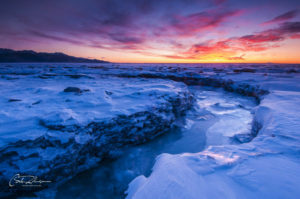 News flash – it gets cold in the winter in Alaska. 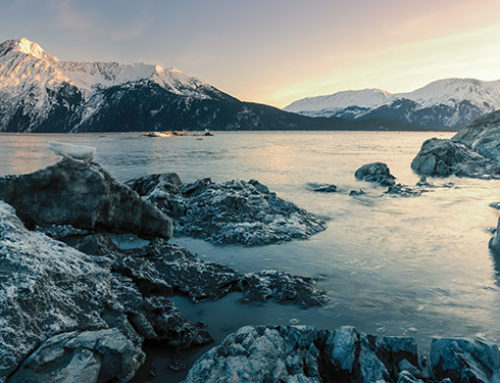 The record cold temperature in the United States was registered at Prospect Creek Camp in Alaska in 1971. It was -80 degrees Fahrenheit. Such temperatures are rare, but certain parts of the Alaskan Interior will see temperatures in the -50 degree range. 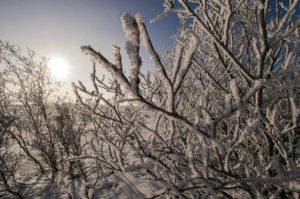 In Anchorage, temperatures can drop to -25 degrees Fahrenheit. 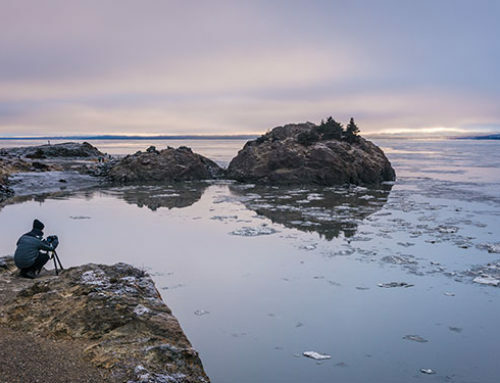 With such cold temperatures, you will rarely find a crowded photo location. 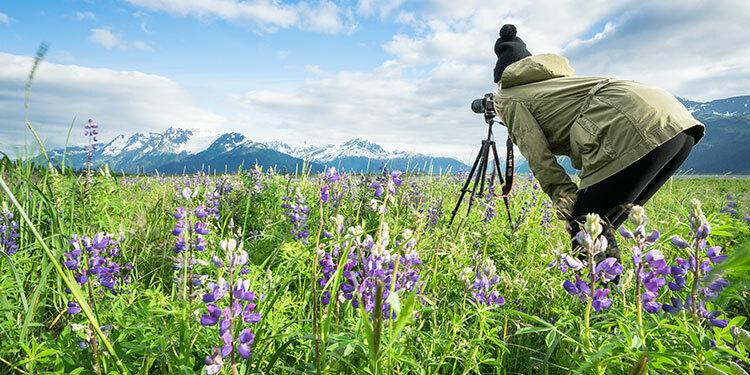 Contact Us to begin planning your Alaska photography adventure today!